What is a Maryland Record Expungement in Montgomery County, Maryland and Prince George’s County, Maryland? In Maryland, record expungement is a process where an individual may formally request the public removal of police and court records. Typically, an expungement is filed when someone is arrested or charged with a criminal or a traffic offense that could potentially lead to incarceration. If the Maryland petition for expungement is granted, the Maryland courts will seal the arrest and criminal records from most publically available databases. Please note, the court will not destroy the records, but the records will no longer be accessible to the public without the court’s permission. Who is Eligible to Obtain an Expungement in Prince George’s County, Maryland and Montgomery County, Maryland? Eligibility for a Maryland record expungement depends on the type of criminal or traffic offense and how the court ultimately handled the case. In most cases, if you are found guilty of a crime, the offense is not expungable, but as of October 2017, several misdemeanor offenses are now expungable even if the offense resulted in a guilty determination. You should consult with an attorney to find out more if you think your conviction may be eligible for a Maryland record expungement. How Do I Obtain a Maryland Record Expungement in Prince George’s County, Maryland and Montgomery County, Maryland? 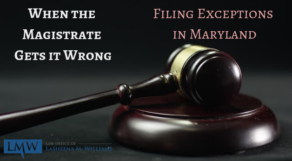 In order to obtain an expungement, you will have to file a Petition for Record Expungement in the Maryland Court where the charge or charges were filed. If the required waiting period has not passed, you may need to file a General Waiver and Release, a form that waives any rights to legal claims and lawsuits arising from the charge, in order to proceed with your petition for expungement. If you want to clear your criminal and traffic record, and you are not sure where to start the process, you should consult with an experienced Maryland Expungement Attorney to learn more about your options. At the Law Office of LaSheena M. Williams, LLC we can help you clear your name, and help you move forward with your life. If you have questions about expunging or sealing your Maryland criminal record, at the Law Office of LaSheena M. Williams can help. Contact us at (301) 778 – 9950 or leave an online request for a consultation. Our firm avidly represents clients across Rockville, Bethesda, Gaithersburg, Silver Spring, Takoma Park, Chevy Chase, College Park, Cheverly, Greenbelt, Oxon Hill, Hyattsville, Upper Marlboro, Largo, Bowie and surrounding communities.